Hearty and satisfying, this tasty vegan loaf makes a comforting meal for those shorter days and colder nights. If you can make a pot of grains, toast walnuts, sauté vegetables and mash beans, then you have the skills to make this loaf! Loaf Pan Size: One 9.25 x 5.25 x 2.75 inch (1 1/4 pound) loaf pan. At a minimum, the loaf pan should hold 8 cups (2 L). Time Saving Tip: Steps 1-3 can be done simultaneously. Preheat oven to 350°F (180°C) prior to starting the barley and toast the walnuts while the barley cooks. Once the walnuts are in the oven, prepare and cook the veggies. In medium saucepan, bring the broth (or water) to a boil and add the pearl barley. Return to a simmer, cover and cook for 15 minutes. Next, add the quinoa to the barley. Return to a simmer, cover and cook for 15 to 20 minutes or until all the liquid is absorbed. Remove from the heat, keep covered and set aside. Preheat oven to 350°F (180°C) and line a small rimmed baking sheet with parchment paper. Spread walnut halves/pieces in a single layer on the baking sheet and toast for 5 to 10 minutes (mine are done around 7 minutes). Give them a toss at the 5 minute mark, if you like, and then watch carefully. The walnuts are done when their coloring has changed to a slightly darker shade. For more toasting tips, see recipe notes. If necessary, chop the walnuts into smaller sized pieces (not into crumbs) or give them a few short pulses in a mini food chopper. In a large skillet, heat oil over medium heat. Add the onion and a few pinches salt. Sauté for 2 to 3 minutes or until softened. Add the mushrooms and bell pepper, stir and increase the heat to medium-high. Sauté until most of the liquid released by the mushrooms has cooked off, 7 to 10 minutes. The mushrooms should be soft and slightly brown. Reducing the heat as necessary, add the minced garlic, seasoning blend, salt and pepper and sauté for about 1 minute or until fragrant. Remove the skillet from the heat and set aside. Preheat oven to 350°F (180°C) and set aside a 9.25 x 5.25 x 2.75 inch (1 1/4 pound) loaf pan. At a minimum, the loaf pan should hold 8 cups (2 L). Do not grease the loaf pan in advance. Make the Flax Egg: Whisk together the flaxseed meal and warm water. Set aside and let rest for 5 to 10 minutes, to thicken. In a large mixing bowl, combine the barley, quinoa and black beans. Using a potato masher, mash the mixture until most of beans are broken apart. Or pulse just the beans in a food processor before adding to the mixing bowl. Next, add the sauté mixture, toasted walnuts, flax egg and bread crumbs to the mashed mixture. Carefully stir (as this will be thick) until well combined. The mixture should easily hold together when a small amount is rolled into a ball with your fingers. If the mixture feels too wet, add more bread crumbs or if the mixture feels too dry, add more broth or water. Make these adjustments in small increments, 1 to 2 tablespoons at a time as a small amount goes a long way. Lightly grease or use parchment paper to line the loaf pan. If using parchment paper, overhang the edges for easy removal. Assemble the Loaf: The key to making this loaf hold together is to layer the mixture and firmly press down each layer. Transfer 1/4th of the mixture (or enough to cover the bottom of the pan) and firmly press the mixture down using a spatula. Neatly press the sides and corners too. Continue to layer the mixture, about 3 more times, firmly pressing each new layer into the previous layer. Make sure the final layer even and smooth. Cover and bake for 45 to 55 minutes or until the top is firm. Next, remove the cover and bake for an additional 4 to 6 minutes or until the top is golden brown. Allow the loaf to rest for 10 to 15 minutes in its pan before inverting onto a cutting board. Wait about 5 minutes (or longer, as the loaf will firm up as it cools) before slicing and serving. Refrigerate leftover loaf in an airtight container for 4 to 5 days. Pearl Barley vs. Hulled Barley: If using hulled barley (instead of pearl barley), cook for 30 minutes and then proceed with the quinoa instructions as written. Walnut Type: Use walnut halves, pieces, or a combination of both (like I did). Keep an extra eye on them if using a combination; the smaller pieces will roast faster. Toasting Walnuts: In addition to darkening skin, doneness can also be checked by popping the oven door ajar; if they smell toasty or you hear faint hissing sounds then walnuts are done. Toast Walnuts in Advance: Prepare walnuts as instructed and allow them to cool completely before storing in an airtight container. Keep refrigerated or store in a cool, dry location. Store bought 21 Seasoning Blend: Use a salt-free blend with a multitude of ingredients and spices for maximum flavor. For this recipe, I used Trader Joe’s 21 Seasoning Salute (which is similar to Costco’s Kirkland Organic No-Salt Seasoning and Bragg’s 24 Herbs & Spices Seasoning). Look for a blend with the following ingredients (it’s fine if it doesn’t have them all): onion, black pepper, celery seed, cayenne pepper, parsley, basil, marjoram, bay leaf, oregano, thyme, savory, rosemary, cumin, mustard, coriander, garlic, carrot, orange peel, tomato granules, lemon juice powder, oil of lemon and citric acid. Substitute Homemade Seasoning Blend: Make your own seasoning blend by substituting the 21 Seasoning Blend with the following spices. 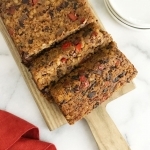 Recipe inspired by Straight from the Earth’s Barley, Quinoa, and Cannellini Bean Loaf recipe.